Are you looking for a simple way to regulate the number of interruptions in your homeschool day? 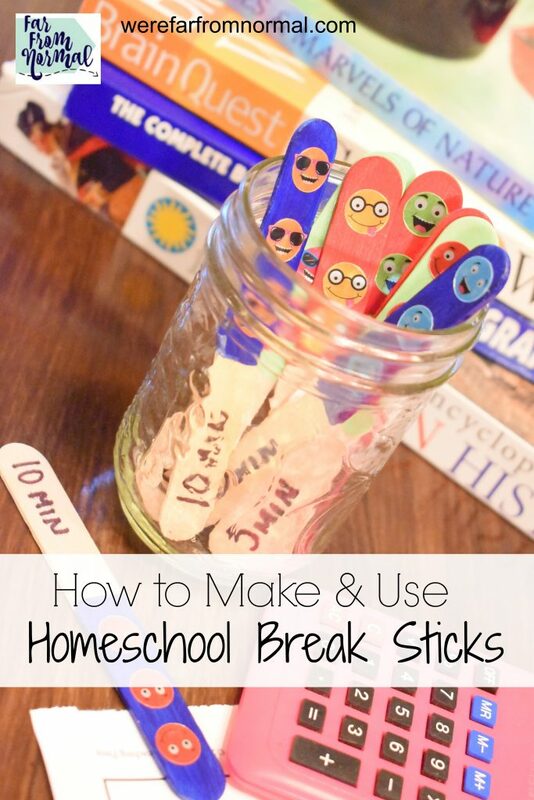 If your kids are frequently asking for breaks to eat, go to the bathroom, or any other reason, homeschool break sticks might be the answer! You’ve just sat down to get started on your homeschool day, you’ve got your lesson planned, your supplies gathered, you take a deep breath to start talking and…. If your house is anything like mine, on some days that will be the first of many interruptions! So I had the idea of creating homeschool break sticks. 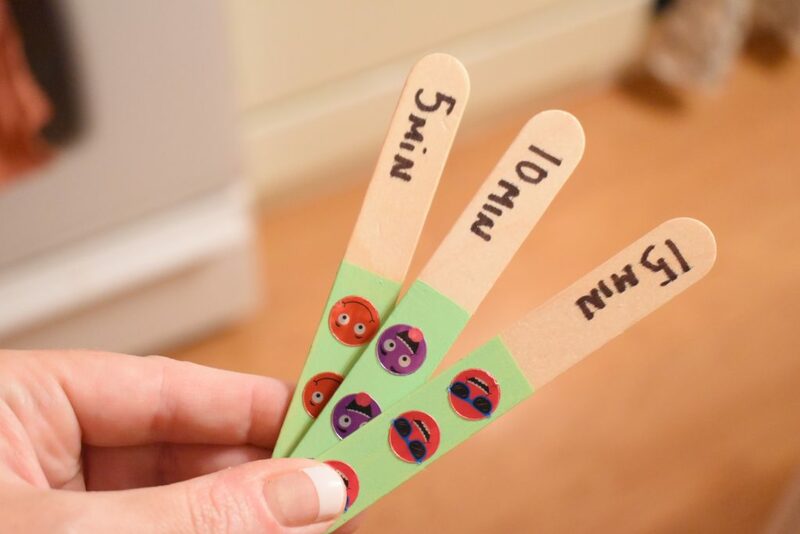 These sticks allow your child to call a “time out” during their schooling. If they need a drink, have to use the bathroom etc. they can pull out a stick and take that break. 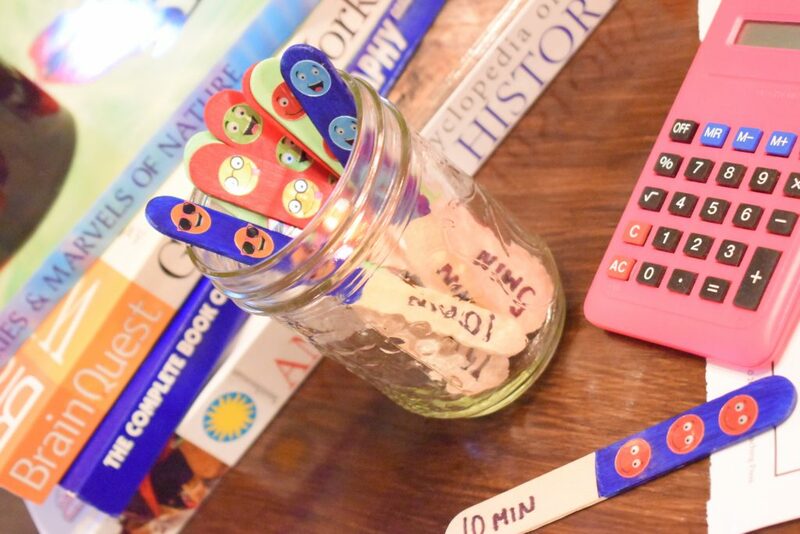 By using the sticks you can limit the amount of interruptions in your schooling and your child learns to think before they use one knowing that they don’t have unlimited breaks to take. Now I’ll say here, I do believe one of the biggest benefits of homeschooling is that your child doesn’t have to raise their hand and get a pass to go to the bathroom, and this might feel kind of like that is what is happening. But it’s not, it’s more about not using going to that bathroom as a reason to take a break from every assignment! In our house, we take 10-minute breaks in between subjects, so these sticks are in addition to that. Often my son spends his in between lessons breaks laying on the couch with the dog, and then 5 minutes into the next lesson he decides he’s hungry. So that is where these break sticks come in. Their time is theirs but they have to choose how to spend it! Now you can use these in a variety of ways. Like I said we do 10-minute breaks so I like to make each stick for 10 minutes. This year I only have my 10-year-old who I’m teaching so I’ve just made three 10 minute sticks for him. If you have multiple kids I recommend making them each 3 sticks and assign them each their own color. If you don’t want to do 10 minutes for each break you can make them 5 or 3 or whatever works for you. You might even make 5, 10 & 15-minute ones so that for different kinds of breaks they can pick a different amount of time. i.e. 5 minutes for the bathroom, 15 minutes to get something to eat. So decide before you make them how they’ll work best for your family. You know your kids and their habits and what would likely suit them the best! You can give each child theirs at the beginning of your school day and let them know that they can use them when they want but once they’re all used up that’s it! Or you can keep them in a jar and allow them to pull one out when they want to use it. Once again you can tweak it to work for your family! 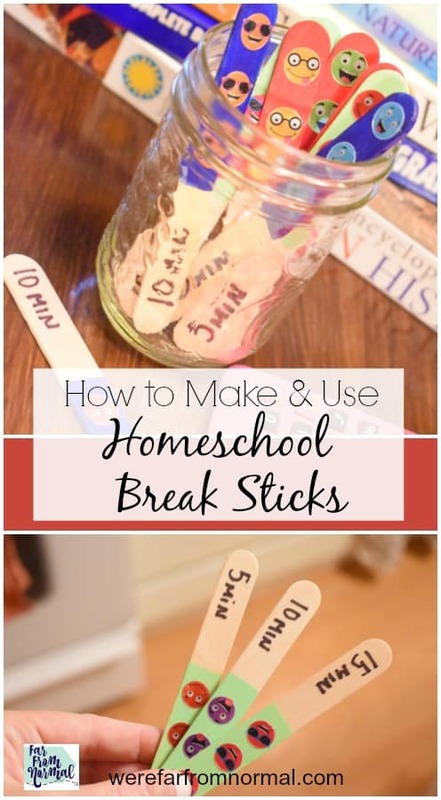 Now making these homeschool break sticks is super easy! You can even let the kids help decorate them if you want! 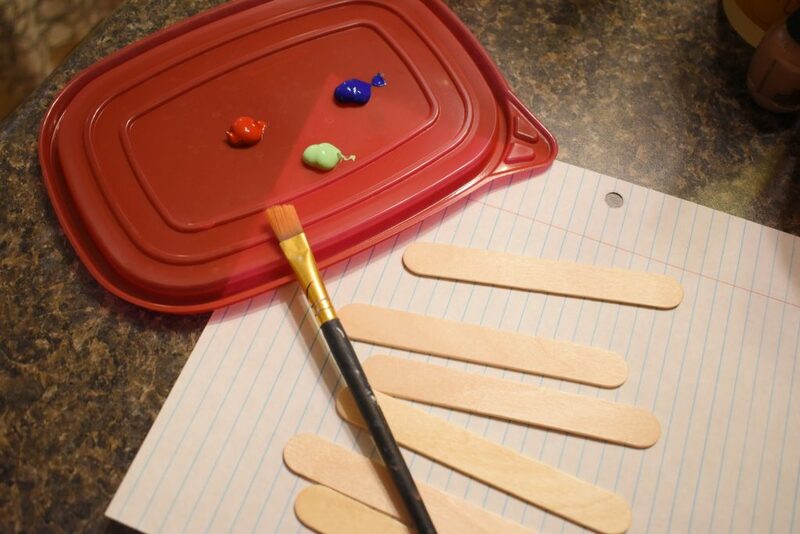 First, you’ll want to figure how many of each color break stick you’ll be making then paint both sides about halfway down. Once the paint dries you might need to add a second coat of paint. Then using a sharpie write how many minutes each stick is good for on the bottom unpainted part. Now decorate them however you want stickers, glitter etc. Once any paint or glue is dry they’re ready to use! I keep ours in a jar in our homeschool cabinet ready to pull out with all our other supplies! 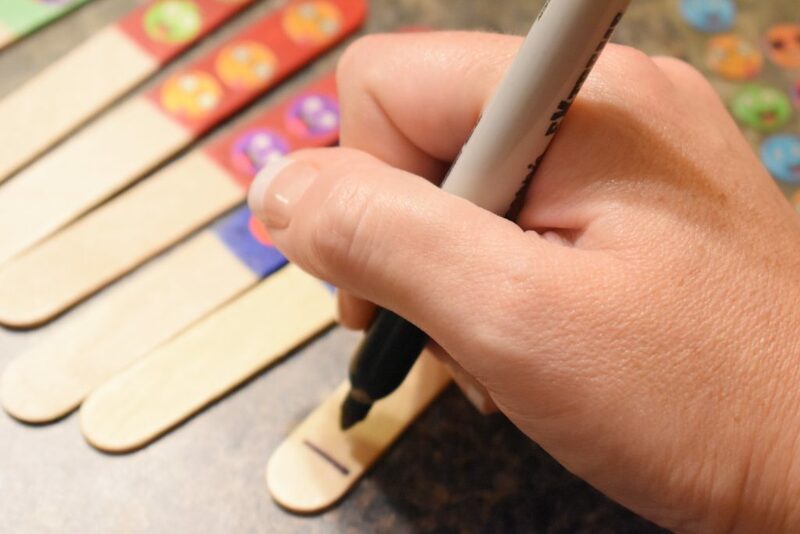 These homeschool break sticks can be a great tool in managing interruptions in your homeschool day and teaching your children to make decisions on how to spend the break time that they have!